Cast: Khalid Abdalla, Shaun Toub, Homayoun Ershadi, Zekeria Ebrahimi, Ahmad Khan Mahmidzada, other people I can't spell. 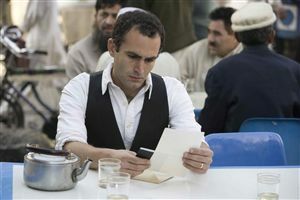 Directed by Marc Forster, adapted from the book by Khaled Hosseini. Story: Afghan kid grows up amidst conflict. Largely subtitled. Chances are you'll have heard of The Kite Runner, but as nowhere seems to be actually showing it, you may have missed the opportunity to catch it yourself. It's definitely worth a bash. Amir and Hassan are two littl'uns in sandy Afghanistan who forge a strong friendship tethered by their shared love of kite flying. Little Hassan has the spooky knack of knowing where a kite is going to land before it does, hence his titular moniker. Stuff happens, the Taliban take over Kabul and our two mites are separated - but that's only the beginning. People who've read the book are divided in their opinions, as is often the case, but allegedly the author wholeheartedly approves (it says so on the internet so it must be true) and it's easy to see why. From the very opening, the characters drag you in and rarely give away what's around the next corner. One particular surprise (Assef's revenge, for those who've seen it) was as shocking as it was unexpected, and makes me question the appropriateness of the 12A certificate. Nothing is explicitly shown, thankfully, but we're left with no doubt what actually happened. The Kite Runner is subtitled - but you know what, I can't even remember how much. I could believe every word was subtitled, or I could believe only a quarter of it was - that's how much I was drawn into the story. Director Marc Forster certainly knows how to craft a human tale - his previous successes include Stranger than Fiction, Monster's Ball and the immensely powerful Finding Neverland - and it's a surprise to see no mention of it in the Oscar nominations list, aside from one measly mention in the Musical Score category. Everything ties together beautifully, the established actors (all fresh to me) mix well with the untrained masses and the cinematography ably conveys the dusty environment, so I really should be raving about it. Many people will do exactly that, I expect, but for me it feels a little short of emotional involvement. Yes, I wanted to know how it ended. Yes, it's very well made and deserved a much wider distribution. No, I wouldn't put it in my top 100 movies. Possibly not even my top 500. It's like Leona Lewis - I know she's good, I recognise her talent, but I still can't get excited about her music. 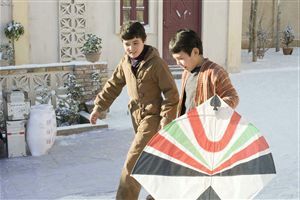 The Kite Runner is, without a doubt, an excellent adaptation of Khaled Hosseini's novel. Top marks to all the pieces, but as a whole it misses out on the zest that made Finding Neverland so moving. I'm being picky though - this is the left-field entry that should have stolen Juno's Oscar nomination. Testosterone Satisfaction Rating: 0/5 - one scene makes for uncomfortable viewing. To enjoy this film you should: like serious stories. The Kite Runner was released in the UK on 26th December 2007.